Elinor thought this generosity overstrained, considering her sister’s youth, and urged the matter farther, but in vain; common sense, common care, common prudence, were all sunk in Mrs. Dashwood’s romantic delicacy. One morning, about a week after his leaving the country, Marianne was prevailed on to join her sisters in their usual walk, instead of wandering away by herself. Hitherto she had carefully avoided every companion in her rambles. If her sisters intended to walk on the downs, she directly stole away towards the lanes; if they talked of the valley, she was as speedy in climbing the hills, and could never be found when the others set off. But at length she was secured by the exertions of Elinor, who greatly disapproved such continual seclusion. They walked along the road through the valley, and chiefly in silence, for Marianne’s mind could not be controlled, and Elinor, satisfied with gaining one point, would not then attempt more. Beyond the entrance of the valley, where the country, though still rich, was less wild and more open, a long stretch of the road which they had travelled on first coming to Barton, lay before them; and on reaching that point, they stopped to look around them, and examine a prospect which formed the distance of their view from the cottage, from a spot which they had never happened to reach in any of their walks before. She walked eagerly on as she spoke; and Elinor, to screen Marianne from particularity, as she felt almost certain of its not being Willoughby, quickened her pace and kept up with her. They were soon within thirty yards of the gentleman. Marianne looked again; her heart sunk within her; and abruptly turning round, she was hurrying back, when the voices of both her sisters were raised to detain her; a third, almost as well known as Willoughby’s, joined them in begging her to stop, and she turned round with surprise to see and welcome Edward Ferrars. He was the only person in the world who could at that moment be forgiven for not being Willoughby; the only one who could have gained a smile from her; but she dispersed her tears to smile on him, and in her sister’s happiness forgot for a time her own disappointment. 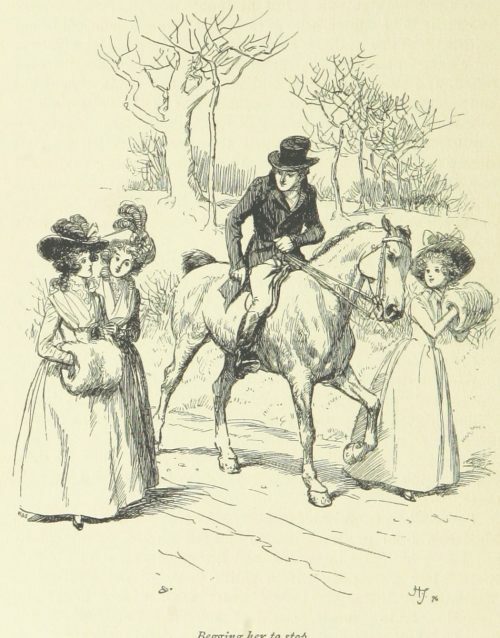 He was welcomed by them all with great cordiality, but especially by Marianne, who showed more warmth of regard in her reception of him than even Elinor herself. To Marianne, indeed, the meeting between Edward and her sister was but a continuation of that unaccountable coldness which she had often observed at Norland in their mutual behaviour. On Edward’s side, more particularly, there was a deficiency of all that a lover ought to look and say on such an occasion. He was confused, seemed scarcely sensible of pleasure in seeing them, looked neither rapturous nor gay, said little but what was forced from him by questions, and distinguished Elinor by no mark of affection. Marianne saw and listened with increasing surprise. She began almost to feel a dislike of Edward; and it ended, as every feeling must end with her, by carrying back her thoughts to Willoughby, whose manners formed a contrast sufficiently striking to those of his brother elect. “A fortnight!” she repeated, surprised at his being so long in the same county with Elinor without seeing her before. “Have you been lately in Sussex?” said Elinor. “And how does dear, dear Norland look?” cried Marianne. “How strange!” said Marianne to herself as she walked on.